With the end of Daylight Saving Time coming up in November, everyone's looking forward to that "extra" hour of sleep we've all been hearing about. But the parents of young children might already be starting to worry. They're imagining what life will be like if their child who's been consistently waking up around 5:00 am will now be ready to start her day at 4:00 am! Certified pediatric sleep consultant and Founder of Baby Sleep 101, Joleen Dilk Salyn works with tired families and assists them with getting their child on healthy sleep routines using the science of sleep and healthy sleep best practices. She offers the following 4 tips for parents to help encourage or maintain a healthy sleep routine through the fall time change. 1. The simple approach: let your child adjust on his own. We all have internal clocks that operate on the light around us - the amount and the timing. 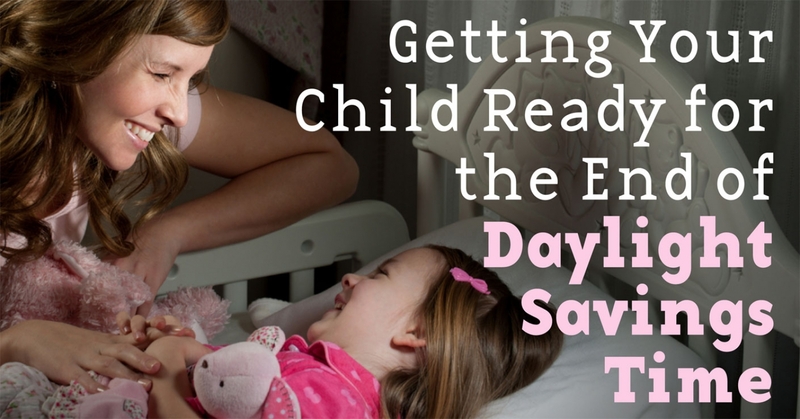 And just like you'll adjust to the time change in a few days, your little one can do the same. To make it even easier on your child, you could gradually move his bedtime forward by 15 minutes each night. He'll be caught up soon! 2. A bit more strategy: shift forward to fall back. Four days before the time change, move your child's entire routine (sleep, meals, wake up time, and playtime) ahead by 15 minutes, and continue that each day. Keep in mind that at first, you'll need to leave your child in bed after they wake up from sleep times (naps and overnight) because they probably won't sleep in automatically right away. 3. The complete routine overhaul. If you've got a child who gets overtired easily, this is the strategy for you. You'll begin a full week before the time change and implement the 15-minute changes very gradually. On some days, you won't switch the routine at all. Your child's body will slowly catch up before being moved forward again. With this approach it's important that you leave your child in bed longer, even if they continue to wake up at the regular time. Match your child's routine up with the time change, but also stay flexible with routine for the following week. Maybe bedtime will need to stay early, or naptime will need to be moved - this method is all about taking cues from your child. Changing up a child's routine is never easy, but navigating seasonal time changes doesn't have to lead to meltdowns. All it takes it a little preparation. With a well-rested baby in your house, you and your family will be less stressed and ready to enjoy the Fall. Baby Sleep 101 was created out of a passion to support parents of children from ages 0-5, who are struggling with their child's sleep issues. Whether their child is having trouble sleeping through the night, taking restorative naps or anything in between, Baby Sleep 101 offers sleep consultations, daily support and in-depth sleep plans designed for their unique situation and parenting philosophy. Visit www.babysleep101.com for more information or tune into The Baby Sleep 101 Facebook page for a free live weekly child sleep Q&A from 8pm-9pm CST every Wednesday night.